You might have heard the F&W media, the parent company of Interweave has filed for bankruptcy. There is a lot of speculation on what is going to happen. Are they restructuring, looking for a buyer or just shutting down? There are a lot of people who are owed money, including authors. I don’t know anything about what is going to happen, but I know I want Interweave to succeed the best it can. I have great admiration for what Interweave has done over the years, and what the employees at Interweave are still trying to do. I was an employee for a decade, and it was an amazing experience. I can’t afford to buy Interweave, but I want to do something. What I can can do to help in a small way is to buy Interweave products. 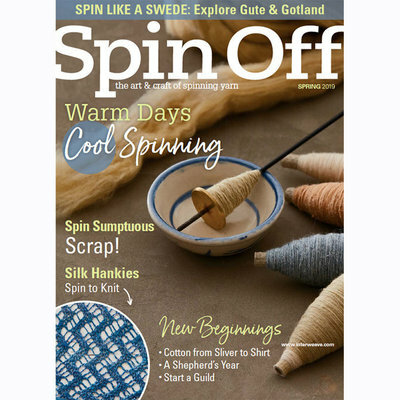 I’ve renewed my Spin Off subscription, I’m buying books and video downloads, and eyeing getting every digital issue of Spin Off that’s available. I hope that my little bit may allow them to pay some of their debt and look attractive to a potential buyer. I also, sadly and realistically, am thinking that if Interweave does shut down, and all of the spinning things go away or are hard to find, what spinning knowledge do I not want to be without? I am not advocating for anyone else to do this, and again, I do not know what is going to happen. People have asked, what I know, what I think, and what, if anything, I’m going to do, this is it. I want Interweave to survive.